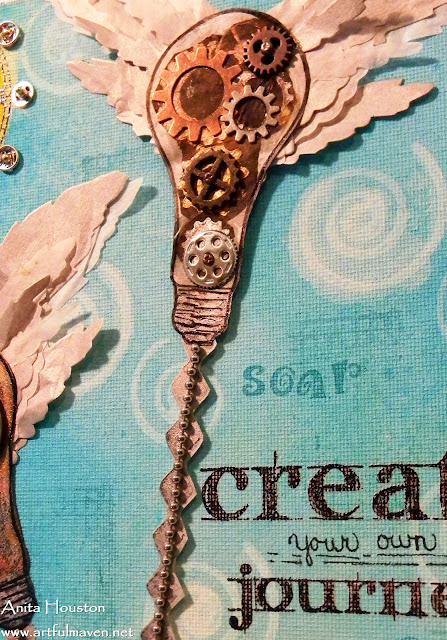 It's time for Part Deux of my Guest Designer Projects for The Artistic Stamper Creative Team Blog! This is a sneaky peek, and the whole thing can be seen at the main site here. Are you seeing a theme develop? If not, go back and look at Project 1 and then you will see it. Many thanks for looking everyone, and for all the wonderful comments on the last one...much appreciated!!! Your creations are always so awesome! Very intriguing! Up Up and Away indeed ! Such creative fun going on with this canvas. love all these details, the light bulb clips ... too cool !! Love those clips you got from Liberty! Dear Anita, I have to tell you I absolutel adore your work of art - everything you show on your Blog is such an inspiration so creative and so unique it is such a joy to surf here! Off to check it out right now... fabulous sneak peek! Off to check out the entire piece! I am enjoying your series! I love the symbolism in this piece, Anita. Your amazing Anita, I just love every detail. This is so wonderful and the lightbulbs! Perfect! love the way you used the ball chain for the string, wonderful!! I'm pinning this one!!! Just want to let you know, every time I see a new project from you in my reader, an unplanned, involuntary "Oh, goodie!" escapes my lips and I get a little giddy. Just sayin'! I've just taken a look - it's breathtaking. I saw the whole work, a really awesome creation! Oh my! Keep them coming!! Love how you used the lightbulb.